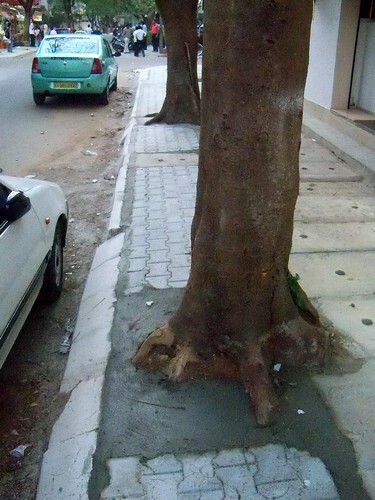 Bangalore Metblogs » Cementing the mistakes.. This is pathetic! When will the BBMP take stock of such idiotic glitches and address them??? The elected reps are more worried about the upcoming elections! Apparently this is not a new thing. It has been happening for ages. There are places where the road is metalled all around neatly packing up the tree. One can feel their own lung choking looking at such pictures. As it is people these days have a penchant for covering the entire courtyard with concrete, on the pretext of keeping their compound ‘clean’! More concrete cover, more heat! Less water seeping down to the ground! You may be glad to know that 4-5 families on our Indiranagar road are (trying to) satnd yp to the BBMP: we’re refusing to allow cementing over/paving over the mud footpaths.